Broadchurch started when I was out walking. Lin Coghlan, my writing tutor at Soho Theatre, always said “take a problem out for a walk”. It’s how I work out my script quandaries, across the cliffs and beaches of West Dorset where I live. In 2011, after writing United for BBC2, I wanted my next project to be as authored and personal as that film. I’d wanted to write a big ensemble drama, set in a small community, for the best part of 10 years. And as I walked, I began to realise that I lived in the perfect setting: my corner of Dorset has an epic, cinematic landscape. 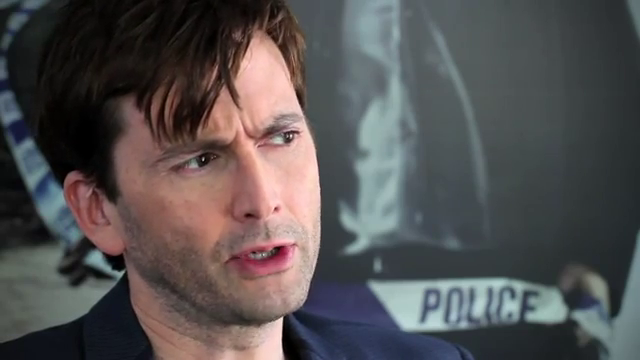 ITV have uploaded another video of their Broadchurch interview with David Tennant. This time he chats about Chris Chibnall's script and what drew him to the part of DI Alec Hardy. Broadchurch starts on Monday 4th March at 9pm. 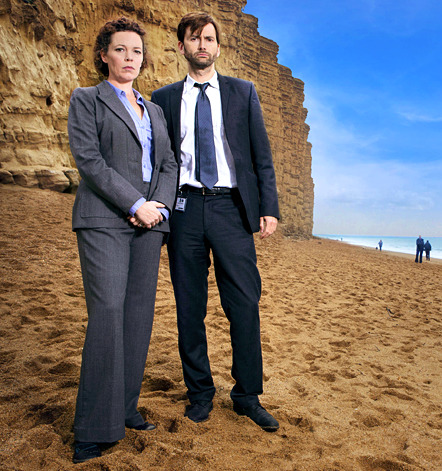 For more information visit our Broadchurch section here. David Tennant will be among a host of stars making a guest appearance - and runs the risk of a shaven head - in a special Red Nose Day edition of the Beano. The BeanoMAX spin off from the classic comic will also feature One Direction, Olly Murs. 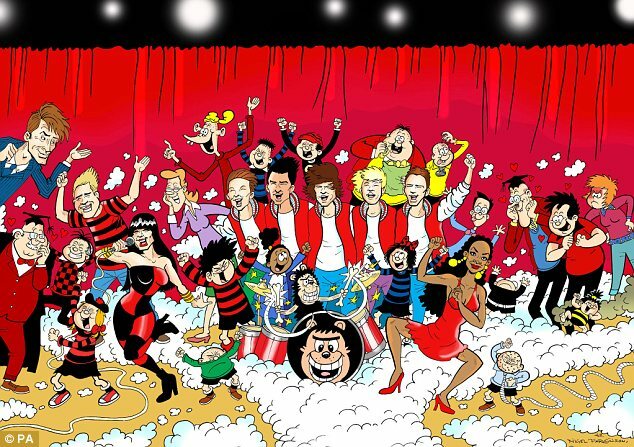 Jedward and Jessie J alongside regular characters Dennis the Menace, Minnie the Minx and the Bash Street Kids. The 'Bald' issue will be co-written and guest edited by comedian Harry Hill and will follow the attempts of the Beano crew to put on a charity show. Harry also sends character Minnie the Minx on a trail of extreme hairdressing which targets the Queen, among other famous faces. He explained: “The bald issue tells the story of hair clippers going out of control. It was everyone I could think of. It was obvious — people associate me with being bald"
One Direction said of their appearance: "We've grown up with the magazine so now to actually appear in it with Dennis and Gnasher themselves is incredible." 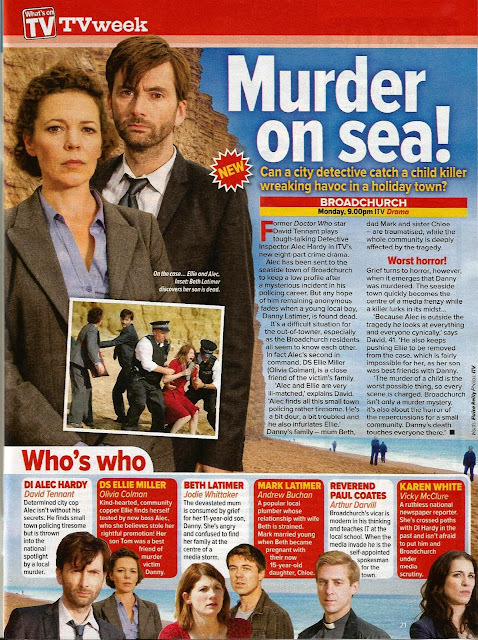 Time Out London have given Broadchurch four out of five stars in their review of the first episode. 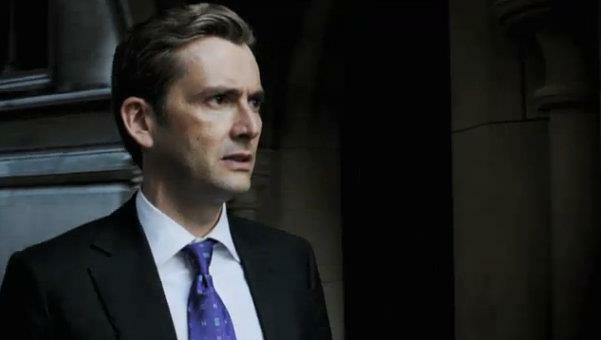 The eight-part crime drama series stars David Tennant and Olivia Colman and begins on ITV on Monday 4th March at 9pm. 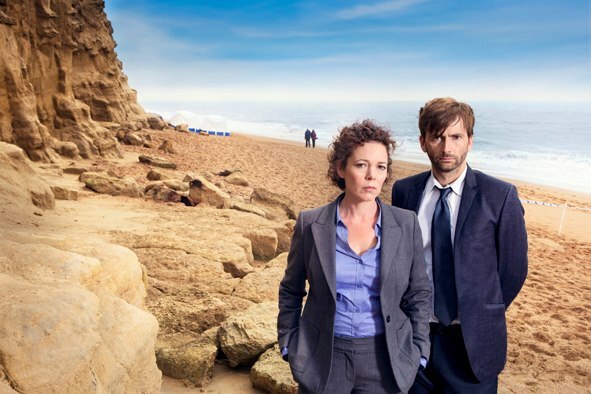 A heavyweight cast steps up for the second missing-child drama of the week, with David Tennant and Olivia Colman the ill-matched investigators charged with finding the killer of a young boy in a seaside town. Jodie Whittaker and Andrew Buchan are superb as the bewildered, grieving parents, and expect Vicky McClure’s nosey Fleet Street hack and Arthur Darvill’s footballing vicar to play bigger roles as the eight-part drama unwinds over the coming weeks. 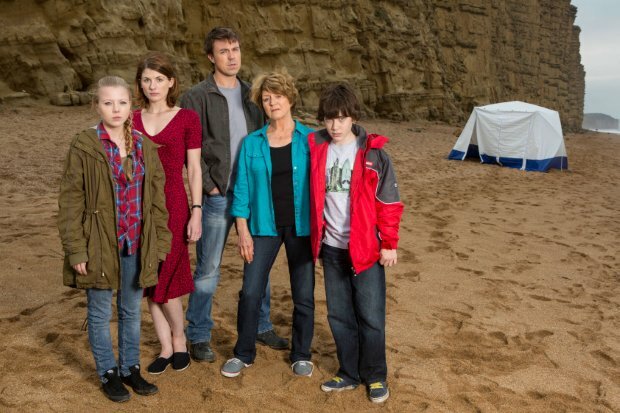 Jodie Whittaker, who plays bereaved mother Beth Latimer in Broadchurch has spoken to TV Choice magazine about her role in the drama. What is the relationship like between Beth and her husband Mark (Andrew Buchan)? Not good. They’ve been together for 15 years, she got pregnant at 15, and as any childhood sweethearts might be, it’s a very normal stage to be at when you’ve been with someone for half your life. Of course the pressure following a child bereavement is immense, nothing compares to it. So any marriage would be severely tested. 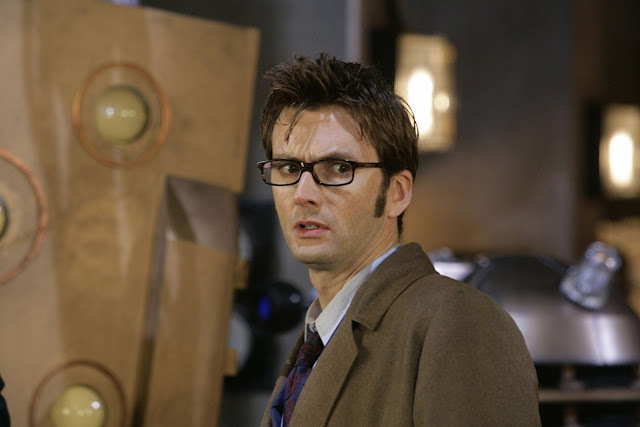 David Tennant has told Time Out London that he is beginning to give up hope of returning to Doctor Who for the show's 50th anniversary. Speaking of the celebrations he maintains his stance that he has heard nothing about appearing in the show and says he is ‘beginning to give up hope that anything’s going to happen’. 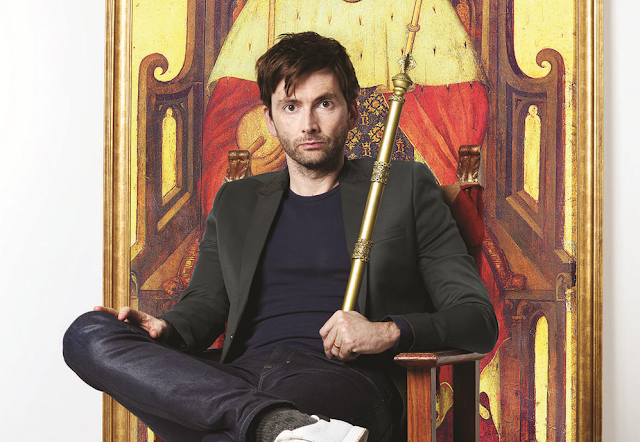 The new issue of Time Out London includes an interview with David Tennant. It's released today and is free from many tube and rail stations across London. Throughout the week it is available at various locations, Click here to find out where to grab your free copy.You can also subscribe to the magazine here. David Tennant bounds into a serviceably plush meeting room at ITV, a ball of bonhomie and enthusiasm, engaging and engaged: all the attributes that make him such a crowdpleaser. He’s 41 now, but his boyish ebullience, carefully dishevelled hair and tweed trousers (okay, maybe not those) mean he could easily pass for ten years younger. ‘The notion of having to be attractive and manly is something I find very difficult to come to terms with,’ he says, wriggling uncomfortably in those tweed trousers, but it’s hard to imagine any previous occupant of the Tardis pulling off wearing Converse. 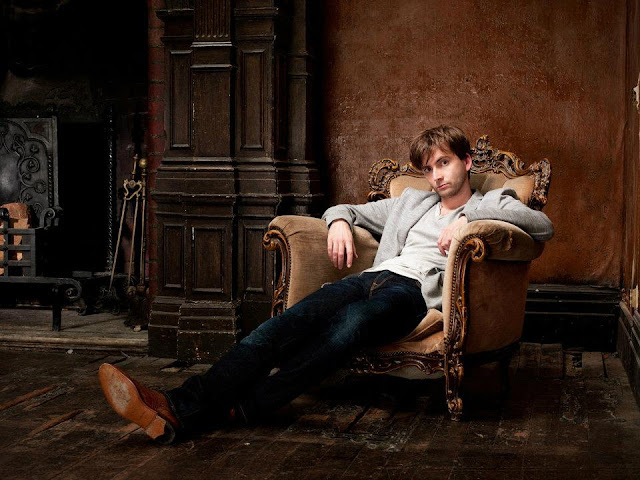 In the midst of all of David Tennant's promotional interviews for Broadchurch this week he has revealed a bit about his preparation for his upcoming BBC Two political drama, The Politician's Husband, telling the Radio Times that to get ready for his role he hung out with MPs. "They all got a bit fidgety, I'm not allowed to say who they were. One used to be a big hitter and isn't anymore. A bit bitter. I was expecting, because they don't stop, they have no life outside, that they'd mind. They loved when they stood up in front of the House and did a speech. They loved it. And it's the same with us." Read the rest of David's interview with the Radio Times here. The Politician's Husband comes to BBC Two soon. You can pre order the DVD here - it is released on 29th April. Visit our The Politician's Husband section here. The 2nd - 8th March issue of Total TV Guide is on sale in the UK from today. 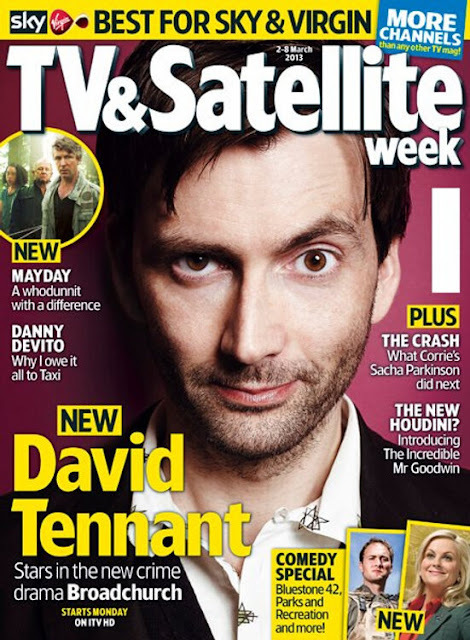 The 2nd - 8th March issue of TV & Satellite Week is on sale in the UK from today. 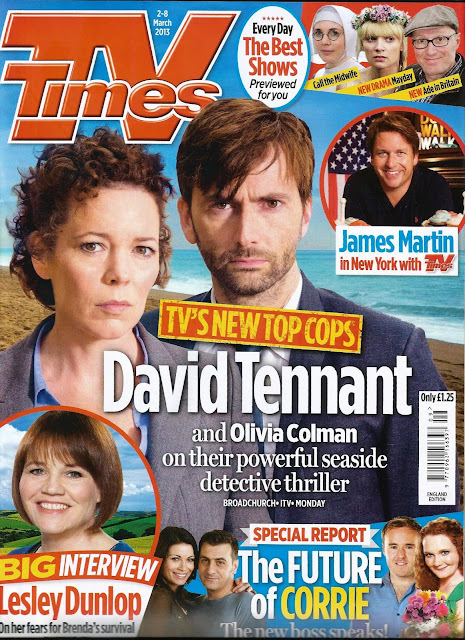 The 2nd - 8th March issue of What's On TV is on sale in the UK from today. 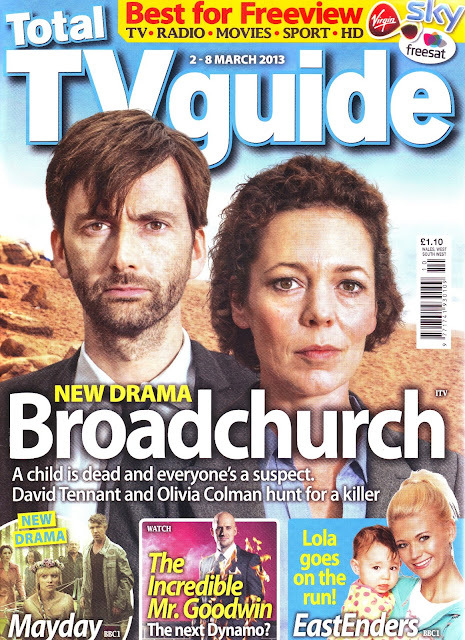 David Tennant talks to TV Choice about his new drama Broadchurch. The 2nd - 8th March issue of the TV Choice is on sale in the UK from today. The 2nd - 8th March issue of the TV Times is on sale in the UK from today. 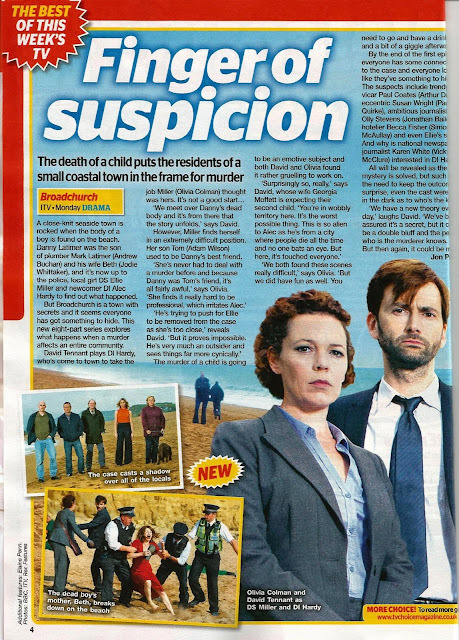 David Tennant and Olivia Colman are interviewed today in the Radio Times about their starring roles in the new ITV crime drama Broadchurch. 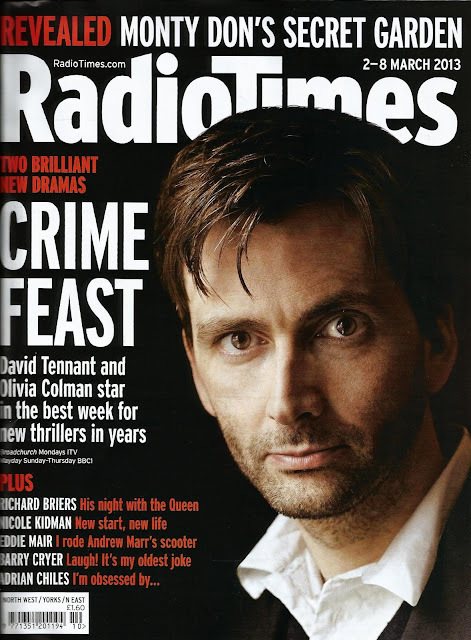 The 2nd - 8th March issue of the Radio Times is on sale in the UK from today. Oscar Night For The Pirates!